Lone Tree Church of God in Christ, Mennonite, McPherson, Kansas. 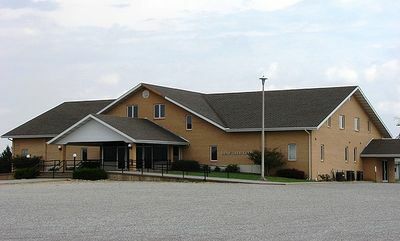 Lone Tree Church of God in Christ Mennonite Church, located 5.5 miles (8.85 kilometers) north and one mile (1.6 kilometers) east of Moundridge, Kansas, was organized in 1878, when 70 persons were baptized by John Holdeman, one of the first congregations of the denomination in Kansas. As the congregation increased the original sod meetinghouse was replaced by a larger building in 1880, which was in turn replaced in 1890 and 1906, and enlarged in 1925, with a seating capacity of 900. Benjamin Schmidt and Henry Koehn were the first residing ministers. Other ministers who have served the church prior to the 1955 ministers are Tobias A. Unruh, John Holdeman, and Jesse Johnson. In 1955, the church had a membership of 540. Most of the members were of Dutch descent and many still spoke Low German at home, but the services were conducted in English. Since this was the largest congregation of the denomination, it had been host to nine conferences by 1955. About 1,200 persons were baptized here from the beginning of the congregation to 1955. Johnson, Jesse. "Lone Tree Church of God in Christ, Mennonite (Moundridge, Kansas, USA)." Global Anabaptist Mennonite Encyclopedia Online. 1957. Web. 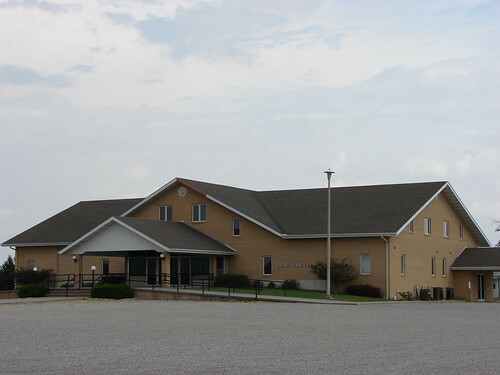 24 Apr 2019. http://gameo.org/index.php?title=Lone_Tree_Church_of_God_in_Christ,_Mennonite_(Moundridge,_Kansas,_USA)&oldid=121594. Johnson, Jesse. (1957). Lone Tree Church of God in Christ, Mennonite (Moundridge, Kansas, USA). Global Anabaptist Mennonite Encyclopedia Online. Retrieved 24 April 2019, from http://gameo.org/index.php?title=Lone_Tree_Church_of_God_in_Christ,_Mennonite_(Moundridge,_Kansas,_USA)&oldid=121594. Adapted by permission of Herald Press, Harrisonburg, Virginia, from Mennonite Encyclopedia, Vol. 3, p. 388. All rights reserved. This page was last modified on 22 April 2014, at 07:23.